OMEGA’s miniature IC11 converters provides all the features required of high quality interface converters in a miniature package and at a low cost! The IC11 intelligent RS-232 to RS-422/485 converter can be selected for half/full duplex, and will allow transmission distances of up to 1220 m (4000'). The IC11 converts an RS-232 signal to RS-422/485. 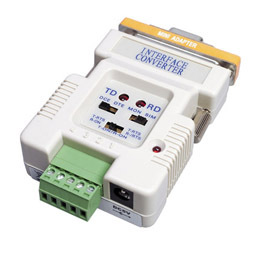 Simply attach one end to an RS-232 device and connect the other end (screw terminals) to an RS-422/485 device. The converter allows data transfer rates up to 120 Kbps. Power is acquired directly from a computer’s serial port, or using the included USB-plug cable. 참고: Each unit supplied with 1.5 m (5') USB-plug cable, DB-25M/DB-9F mini-gender changer and complete operator’s manual.